The enlistment records of many Irish recruits during the Civil War provide detail on age, height, hair/eye colour and complexion. Although informative, this data still leaves us without a picture of life experience, or any insight into character. One exception was those men who enlisted in the Union navy. The marks and scars they acquired during their lifetime were recorded on enlistment, providing us with a unique opportunity to garner more detail about both their appearance and their personalities. Perhaps most fascinating of all are those marks that the Irishmen had chosen for themselves- their tattoos. I have recently examined the enlistment records of the New York Naval Rendezvous for July 1863 to create a database of those Irishmen who enlisted during that month, 150 years ago. Of 1,064 men who were recorded as signing on between 1st and 31st July, a total of 319 were listed as being of Irish birth. They will form the topic of a number of posts on the site in the coming days. Naval recruits were seen as being of the rougher sort, often with a different set of motivations for enlisting when compared with other branches of service. Many were from extremely poor backgrounds and inhabited some of the most notorious districts of New York, such as the Five Points. By and large they were working class men- to study them is to examine the reality of urban life for the majority of Irish emigrants. Tattoos are most commonly associated with sailors in this period. 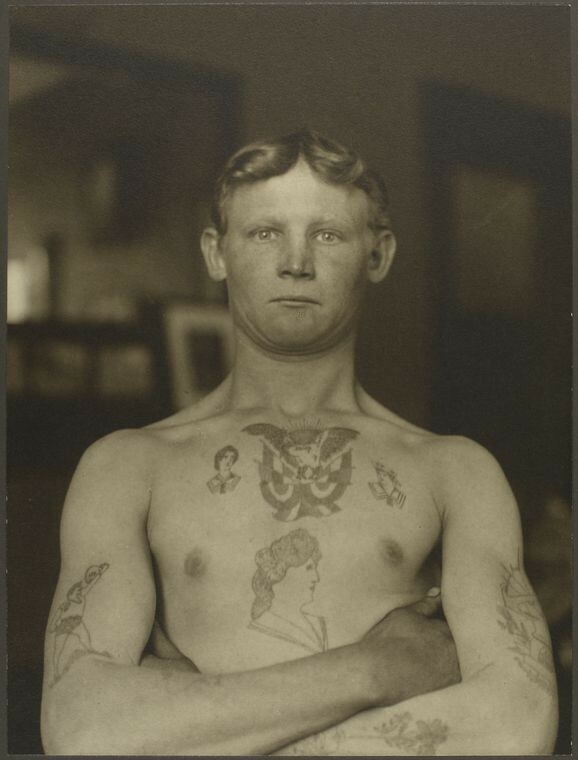 What is fascinating about this group is that although all of them were bound for the navy, it was clear that many of the men who bore tattoos had no previous maritime experience. This allows us to envisage a scenario where a significant proportion of the working class Irish population (and indeed the working class generally) wore tattoos- indeed it must have been a common sight in areas like the Five Points. I hope in the future to extend my look at the Irish recruits in the navy and along the way discover more regarding the tattoos that were prevalent among the Irish community of New York. *I am indebted to Dr. Matt Lodder for graciously providing information regarding sources and for his advice generally regarding 19th century tattooing and its interpretation. **With regard to this question, see the contribution by Marc Hermann in the comments section below, which seems to confirm that these are most probably the numbers of Fire Engine, Ladder and Hose Companies. Naval Enlistment Weekly Returns, New York Rendezvous, July 1863. New York Times 16th January 1876. Tattooing in New York, A Visit Paid to the Artist. Dye, Ira 1989. 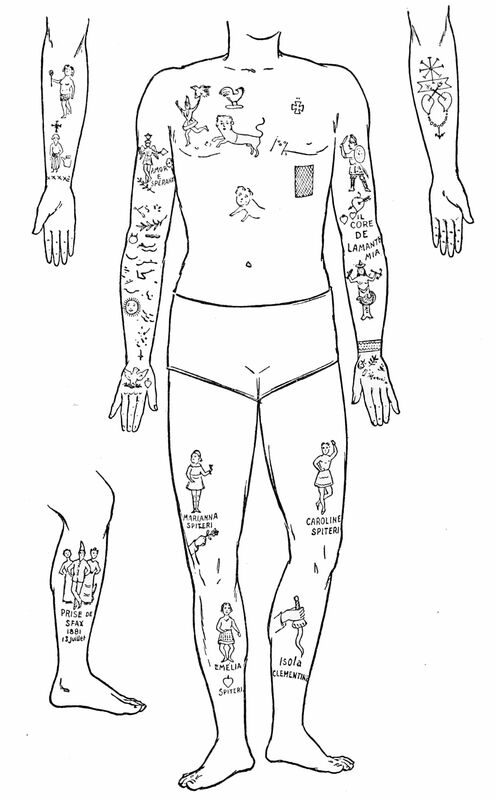 ‘The Tattoos of Early American Seafarers, 1796-1818’ in Proceedings of the American Philosophical Society, Vol. 133, No. 4, pp. 520-554. New York Public Library Digital Gallery. In the New York Fire Department, Engine Co. 17 was named “East River,” so that’s the best explanation for that particular one, and I’m inclined to believe that the other numbers represent other fire companies. However, I can’t find any of these “numbered” men on the 1861 or 1862 NYFD rosters, but they may very well have been among the numerous unofficial “runners” who associated with the companies. Many thanks for the comment- that is fantastic about Engine Co. 17 being East River, that settles that one. Ladder or Fire companies were my first thought as well so that is good to know. It would seem likely that the rest of the men were also associated in some way with them too even if they aren’t on the rosters. As you will see in a later post a large number of the men who enlisted in the Navy in July 1863 were Firemen. I am hoping as well that when I expand the sample I will find more evidence for tattoos like this. Are you aware of good sources for the Fire Services in New York in this period? I would love to find out more about this aspect of the city, particularly given the heavy Irish involvement. Thanks for solving the mystery! Of course, the classic work is A.E. Costello’s “Our Firemen” which has been re-printed. That is great many thanks for sharing that information, I will be sure to check them out and also pick up Costello’s book. Also I have added a note to the post directing readers to your comment which answers the question regarding the numbers. Out of interest have you come across reference to them doing this before? I checked out your site there as well, some great work on the Fire Zouaves, a fascinating unit! Just a random thought, but could that “42” tattoo perhaps be a reference to previous service in the British army’s 42nd Royal Highland Regiment (The Black Watch)? I’ve read that a good many Irish either enlisted or were conscripted to serve with that unit during this period. There’s even an Irish folksong entitled “The Gallant Forty Twa” which can be heard in several versions on YouTube. Thanks for the suggestion! It is not beyond the realms of possibility, but I think it seems likely they are related to the Fire Companies in New York, although this might not be the case with all of them. I have come across quite a few ex British Army men in the Union and Confederate armies- many had served in the Crimea prior to the American Civil War, so some may well have had marks identifying them with their former service. Conway’s age is listed as 21 and the year is 1863, so 42 could also be his year of birth. Cool overview of period tattoos. Some of these men may have already served in army volunteer units or in the militia. I’ve seen references to camp tattoo artists but never found much detail about their methods. That is a possibility! There are a few references in things like the Official Records alright to tattoos, and there were some operating with the armies. It would be a really interesting topic to find out more about. There is the famous story of the Confederate supposedly being bayoneted (I think outside Atlanta?) for having ‘Fort Pillow’ tattooed on his arm for example, so it certainly happened. Great little article, really interesting to see this. My great great grandfather’s three brothers left Dublin (he stayed behind) and all three enlisted during the Civil War. One of them in the Navy, I first got his pension papers a few years back and it noted that he had a tattoo on his right arm H.T. (his initials) and the number 39. His wife explained in the pension application what the 39 stood for but the writing was impossible to decifer. My best guess was ‘Engine 39.’ This more or less confirms that. Keep up the good work ! Many thanks! That is a really interesting piece of family history- did all three of them survive? Also thanks for relating that regarding the tattoo- I would love to go through all of them to see just how prevalent getting the Fire Company’s number was- it would seem to have been quite common. Really fascinating stuff! was.” Hugh died in 1907, his grandson served with the US Army during the First World War. Fascinating stuff- you have clearly done a great deal of research on them. The number of these stories that have emerged through correspondence with people such as yourself on the site is remarkable. It just goes to show how strongly the war impacted on the Irish everywhere, something that we have to try to bring out more in Ireland. It is really interesting about Hubert’s drinking- in ‘Union Jacks’, the best book on the ordinary sailor’s experience of the war, it was related that a lot of men who joined the navy were plied with drink beforehand- indeed recruiters were often located close to or even connected to drinking establishments. This might have been how Hubert started his naval career- a really interesting story! Really interesting article and well-researched. The subject of Civil War soldiers bearing tattoos is something I’d like to know more about. Seems quite incongruous to me…. Hidden Histories: From Hildebrandt to Johnny Eagle. | Come Here To Me!